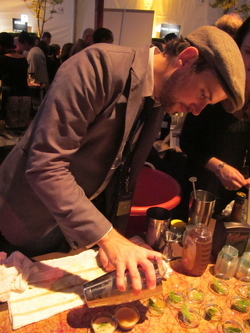 Tommy “Tweed” Klus serving the Derby Cocktail #Rhum at SF Chefs. Opening to the public this Friday August 12th is ~BARREL ROOM~, the new wine bar that moved into the former Hidden Vine space from Sarah Trubnick and Nikki Goddard. The ladies gave the place a thorough cleaning, but the living room style remains, with newly acquired antique furniture (and a new fireplace—perfect for our summer months). The wine list will include small production wines from around the world, and from August-September, the wines by the glass will have a strong focus on the wines of France. There will also be flights available for guests to explore varietals, like French pinot noir. The menu also includes flatbreads with different toppings that will reflect that month’s highlighted region. 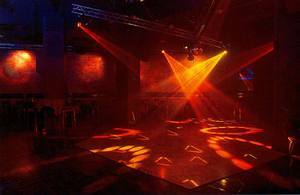 Hours are Sun-Thu 5pm-12am, Fri-Sat 5pm-2am. 620 Post St. at Taylor; entrance on Cosmo Pl. (no phone yet). Perhaps you had a refreshing Combier cocktail from visiting bartender Tommy Klus, aka Tommy Tweed, at SF Chefs this weekend? He has spent time behind the stick at Portland’s Teardrop Lounge, Bluehour, and St. Jack, and just opened Kask, where he is currently bar program director. Tonight (Tuesday) he will be a guest behind the bar at Rye, and Wednesday he will be at 15 Romolo before leaving us and heading back up to Oregon. And this Thursday August 11th is an M7 (Magnificent 7) party, Wine and Culinary Tasting Celebration: “The Revolucionarios” at Cantina. (M7 is a continually growing group of young entrepreneurs changing the Bay Area and beyond with their innovations in food, wine, technology, libations, and ideas.) There will be wines poured from Toolbox Wines, Delgadillo Cellars, a selection of Italian wines from Biondivino, some pisco cocktails by Duggan McDonnell, and beer will be provided by Heineken. To eat, there will be some appetizers from Pete Mrabe of Don Pisto’s, and cupcakes by Chelsea Mead of Kingdom Cake. All attendees receive a complimentary Square, and there will also be prizes and giveaways. Tickets: VIP (you get a sweet gift bag) is $77, or $35 pre-sale/$40 door. 8pm-11:30pm. 580 Sutter St. at Mason. 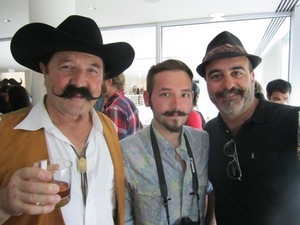 At Chris Sollars and Comstock Saloon’s Whiskey Waxing YBCA event; photo by Alison Pebworth. I think we know where most bartenders in this town will be on Monday August 15th: at ~COMSTOCK SALOON~’s Whiskey Waxing Competition. The contestants will be “judged on their form and ability to sip whiskey or tea. All sizes, shapes, and styles considered. It’s not the size of your sweep, but the shape of your broom!” Prizes include fine bourbons, single malts, and coveted drams spanning the globe, as well as VIP tours of Anchor Brewery and admission to WhiskyFest San Francisco. Judges include master distiller Lance Winters from St. George Distillery in Alameda. Whether you’re whiskery or not, you’ll be able to partake in $5 Boothby cocktails, $5 sidecars, and tastes of St. George’s pre-release whiskey! There will also be a live barbershop quartet to keep your toes tappin’. Contestants need to RSVP here with “Whiskey Wax” in the subject line. Registration is at 7pm, competition at 8pm. The former Manhattan Lounge; photo courtesy of Lineal Design. Grub Street and Inside Scoop both jumped on the liquor license activity for ~EDITION~, a new bar from Brian Sheehy, Doug Dalton, and Steve McKinley of Future Bars/Destination Bars. The location is the former Manhattan Lounge—which was in the basement of the Hearst Building and closed 10 years ago. Grub Street spoke with Sheehy, who said: “It’s going to be along the lines of our other bars, Rickhouse and Bourbon & Branch, focused on the spirits and the cocktails. But we’re still probably a year or more away from opening. We’re in no rush.” The Scoop spoke with Sheehy as well, stating that the location “won’t follow the Prohibition theme of Bourbon & Branch, nor the distillery/warehouse look of Rickhouse”—an “old industrial feel” is what was mentioned. We’ll have to see how it all pans out for an opening in 2012. 691 Market St. at 3rd St. Meanwhile, over in the Marina, the old Gravity space (which was going to become Hudson) is now going to be ~REED &AMP; GREENOUGH~. Eater reports owner Paul Owens (Tortilla Heights) discovered that looted wood from the former Reed & Greenough Distillery was used to rebuild 3251 Scott Street after the 1906 quake and fires. The wood façade looks pretty darned cool. There’s also word of some turbo taps that can fill a pint in less than two seconds (uh, whoa); the plan is to open on Monday August 22nd. 3251 Scott St. at Chestnut. The Foreign Cinema main dining room. I am seriously debating coming back from Tahoe early so I can attend this special Champagne tasting and seminar at ~FOREIGN CINEMA~ on Thursday August 18th. Wine director Zach Pace will cover topics including Champagne growing and production; climate issues pertaining to grape growing; styles of sparkling wine throughout the world; how to read the label; and classic and contemporary food pairings, complete with small tastes from chefs Gayle Pirie and John Clark. You will be tasting and discussing the following selection of sparkling wines: Roederer Estate Brut Rosé, Anderson Valley NV; Collet Brut Grand Art, Champagne NV; Bartholomieu Brut Blanc de Blancs 2002; Agrapart Père et Fils Brut Rosé NV; Collet Demi-Sec NV; and Jacquesson Cuvée 734. Those staying for dinner after the class will also receive a complimentary glass of Collet Brut Champagne. 5:30pm-7:30pm. $125 per person (the first 10 people to RSVP via Facebook or Twitter by including @ForeignCinemaSF in the tweet will be offered a discounted price of $95—there are still a few spots left!). 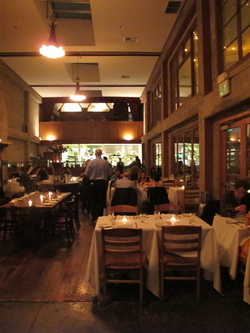 Reservations can be made by calling 415-648-7600.